DIE Martis, 24 die Octobris. Letter from the Commissioners with the King. Letter to them, with the Declaration about Delinquents. Message to the H. C. with it. Papers of the she Treaty. Delinquents to be exempted from Pardon. Message from the H. C. with a Vote about the Treaty, and an Order. L. Capell to be removed to The Tower. Letter from the Commissioners with the following Papers about the Treaty. 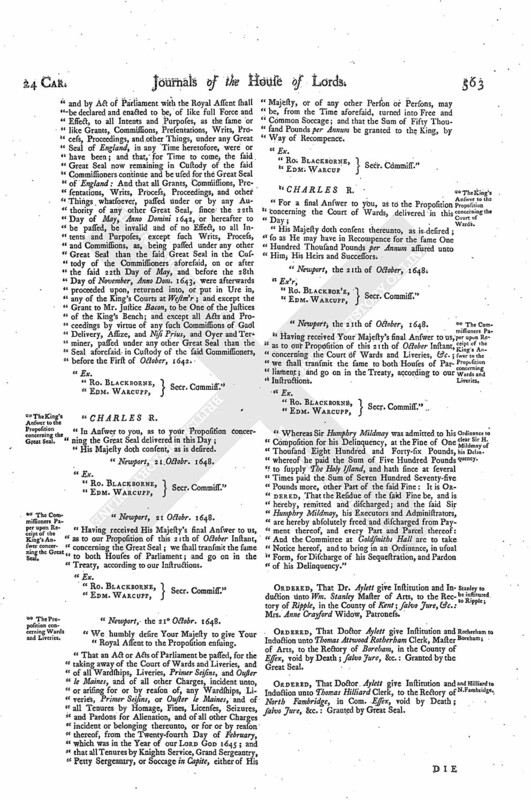 ** The Commissioners Paper, expressing the Defects of His Majesty's Answer to the Propositions of the Church. ** The King's final Answer to the Propositions concerning the Church. 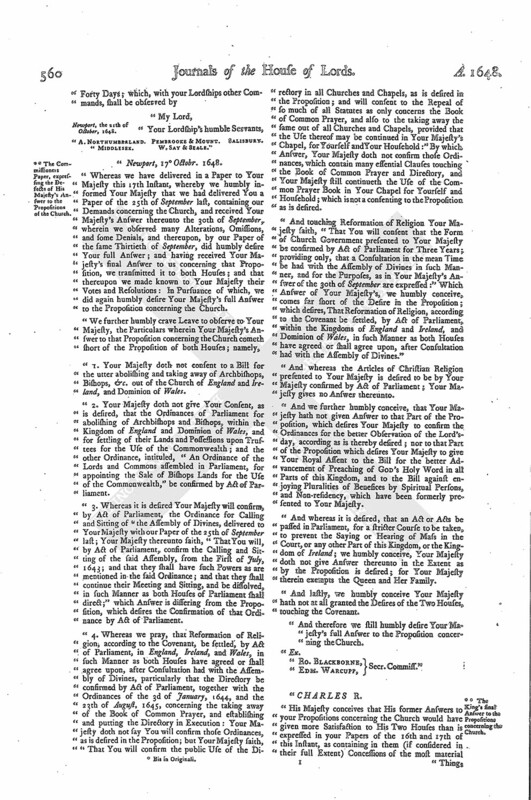 ** The Commissioners Paper upon the King's final Answer to the Propositions of the Church. ** The Proposition concerning Great Officers in England. ** The King's Answer to the Propositions concerning the Nomination of Officers. ** The Commissioners Paper, upon Receipt of the King's Answer to the Proposition concerning Nomination of Officers. ** Proposition concerning the City of London. ** His Majesty's Answer to the Proposition concerning London. 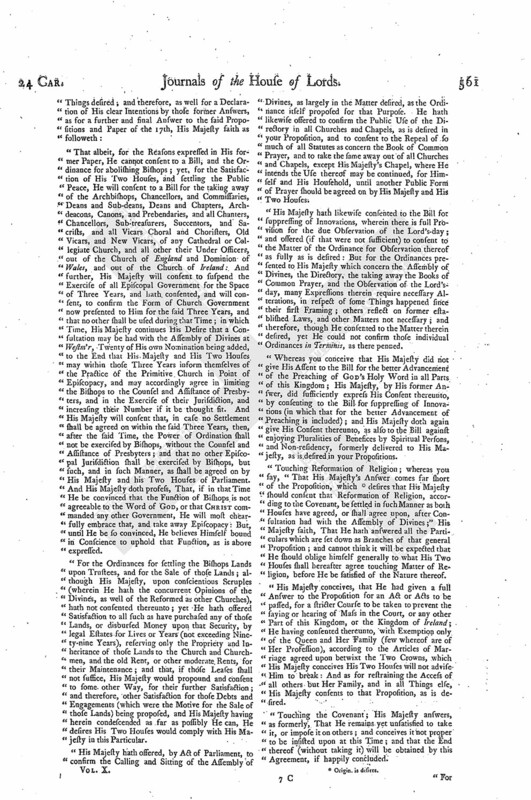 ** The Commissioners Paper upon Receipt of the King's Answer to the Proposition concerning the City of London. ** The Proposition touching the Great Seal. ** The King's Answer to the Proposition concerning the Great Seal. ** The Commissioners Paper upon Receipt of the King's Answer concerning the Great Seal. ** The Proposition concerning Wards and Liveries. ** The King's Answer to the Proposition concerning the Court of Wards. ** The Commissioners Paper upon Receipt of the King's Answer to the Proposition concerning Wards and Liveries. Ordinance to clear Sir H. Mildmay of his Delinquency. and Hilliard to N. Fambridge. The Speaker acquainted the House, "That Yesterday Sir Peter Killegrewe brought a Packet from the Commissioners (fn. 1) treating with the King, in the Isle of Wight;" which were read, as followeth. "We are commanded, by the Lords and Commons in Parliament assembled, to send you this inclosed Vote, as their Resolution; and to give you Thanks from them, for your great Care and Diligence in managing of the Treaty, according to your Instructions. This is all we have in Command for the present." To desire Concurence in the Letter abovesaid, and that it may be signed by the Speakers of both Houses. Ordered, That the Papers of the Treaty shall be taken into Consideration on Thursday Morning next; against which Time the Lords are to have Notice to attend the House. 1. Resolved, upon the Question, That the Lord Cottington shall be One. 2. Resolved, upon the Question, That George Lord Digby shall be One. 3. Resolved, upon the Question, That Sir Robert Heath Knight shall be One. 4. Resolved, upon the Question, That Sir Francis Doddington shall be One. 5. Resolved, upon the Question, That Sir George Radcliffe shall be One. 6. Resolved, upon the Question, That Sir Richard Greenvile shall be One. 7. Resolved, upon the Question, That Sir Charles Dallison Knight shall be One. The rest of the Persons in the First Exception are not to stand. That this House agrees to the Letter and Order now brought up. Upon reading the Petition of Wm. Williamson, &c.
It is Ordered, That Thomas Sheercliffe shall have a Copy of the Petition, and return his Answer to the same on Friday Morning next; and then this House will give further Directions. Ordered, That this House will take into Consideration, on Friday Morning, the Business of making a Lord Chief Justice of the King's Bench, and how Sir John Brampston may have some (fn. 2) Desideration for his Loss of the said Place; and then also the Consideration of the Lord Chief Baron's Place. Ordered, That the Lord Capell shall be removed from Windsor, to The Tower of London. Ordered, That Richard Parris shall be brought before the Lords on Thursday Morning, to give an Account concerning the Hand-writing of his Petition. "For the Right Honourable the Earl of Manchester, Speaker of the House of Peers pro Tempore, at Westm'r. Newport, the 21th of October, 1648. "Whereas we have delivered in a Paper to Your Majesty this 17th Instant, whereby we humbly informed Your Majesty that we had delivered You a Paper of the 25th of September last, containing our Demands concerning the Church, and received Your Majesty's Answer thereunto the 30th of September, wherein we observed many Alterations, Omissions, and some Denials, and thereupon, by our Paper of the same Thirtieth of September, did humbly desire Your full Answer; and having received Your Majesty's final Answer to us concerning that Proposition, we transmitted it to both Houses; and that thereupon we made known to Your Majesty their Votes and Resolutions: In Pursuance of which, we did again humbly desire Your Majesty's full Answer to the Proposition concerning the Church. "1. Your Majesty doth not consent to a Bill for the utter abolishing and taking away of Archbishops, Bishops, &c. out of the Church of England and Ireland, and Dominion of Wales. "2. Your Majesty doth not give Your Consent, as is desired, that the Ordinances of Parliament for abolishing of Archbishops and Bishops, within the Kingdom of England and Dominion of Wales, and for settling of their Lands and Possessions upon Trustees for the Use of the Commonwealth; and the other Ordinance, intituled, "An Ordinance of the Lords and Commons assembled in Parliament, for appointing the Sale of Bishops Lands for the Use of the Commonwealth," be confirmed by Act of Parliament. "3. Whereas it is desired Your Majesty will confirm, by Act of Parliament, the Ordinance for Calling and Sitting of (fn. 3) the Assembly of Divines, delivered to Your Majesty with our Paper of the 25th of September last; Your Majesty thereunto faith, "That You will, by Act of Parliament, confirm the Calling and Sitting of the said Assembly, from the First of July, 1643; and that they shall have such Powers as are mentioned in the said Ordinance; and that they shall continue their Meeting and Sitting, and be dissolved, in such Manner as both Houses of Parliament shall direct;" which Answer is differing from the Proposition, which desires the Confirmation of that Ordinance by Act of Parliament. "4. Whereas we pray, that Reformation of Religion, according to the Covenant, be settled, by Act of Parliament, in England, Ireland, and Wales, in such Manner as both Houses have agreed or shall agree upon, after Consultation had with the Assembly of Divines, particularly that the Directory be confirmed by Act of Parliament, together with the Ordinances of the 3d of January, 1644, and the 23th of August, 1645, concerning the taking away of the Book of Common Prayer, and establishing and putting the Directory in Execution: Your Majesty doth not say You will confirm those Ordinances, as is desired in the Proposition; but Your Majesty faith, "That You will confirm the public Use of the Directory in all Churches and Chapels, as is desired in the Proposition; and will consent to the Repeal of so much of all Statutes as only concerns the Book of Common Prayer, and also to the taking away the same out of all Churches and Chapels, provided that the Use thereof may be continued in Your Majesty's Chapel, for Yourself and Your Household:" By which Answer, Your Majesty doth not confirm those Ordinances, which contain many essential Clauses touching the Book of Common Prayer and Directory, and Your Majesty still continueth the Use of the Common Prayer Book in Your Chapel for Yourself and Household; which is not a consenting to the Proposition as is desired. "And touching Reformation of Religion Your Majesty faith, "That You will consent that the Form of Church Government presented to Your Majesty be confirmed by Act of Parliament for Three Years; providing only, that a Consultation in the mean Time be had with the Assembly of Divines in such Manner, and for the Purposes, as in Your Majesty's Answer of the 30th of September are expressed:" Which Answer of Your Majesty's, we humbly conceive, comes far short of the Desire in the Proposition; which desires, That Reformation of Religion, according to the Covenant be settled, by Act of Parliament, within the Kingdoms of England and Ireland, and Dominion of Wales, in such Manner as both Houses have agreed or shall agree upon, after Consultation had with the Assembly of Divines." "And whereas the Articles of Christian Religion presented to Your Majesty is desired to be by Your Majesty confirmed by Act of Parliament; Your Majesty gives no Answer thereunto. "And we further humbly conceive, that Your Majesty hath not given Answer to that Part of the Proposition, which desires Your Majesty to confirm the Ordinances for the better Observation of the Lord's day, according as is thereby desired; nor to that Part of the Proposition which desires Your Majesty to give Your Royal Assent to the Bill for the better Advancement of Preaching of God's Holy Word in all Parts of this Kingdom, and to the Bill against enjoying Pluralities of Benefices by Spiritual Persons, and Non-residency, which have been formerly presented to Your Majesty. 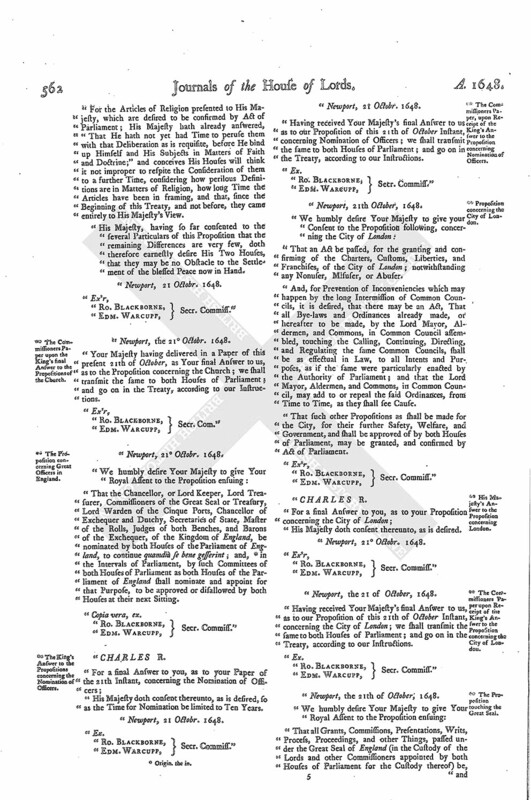 "And whereas it is desired, that an Act or Acts be passed in Parliament, for a stricter Course to be taken, to prevent the Saying or Hearing of Mass in the Court, or any other Part of this Kingdom, or the Kingdom of Ireland; we humbly conceive, Your Majesty doth not give Answer thereunto in the Extent as by the Proposition is desired; for Your Majesty therein exempts the Queen and Her Family. "And lastly, we humbly conceive Your Majesty hath not at all granted the Desires of the Two Houses, touching the Covenant. "And therefore we still humbly desire Your Majesty's full Answer to the Proposition concerning the Church. "That albeit, for the Reasons expressed in His former Paper, He cannot consent to a Bill, and the Ordinance for abolishing Bishops; yet, for the Satisfaction of His Two Houses, and settling the Public Peace, He will consent to a Bill for the taking away of the Archbishops, Chancellors, and Commissaries, Deans and Sub-deans, Deans and Chapters, Archdeacons, Canons, and Prebendaries, and all Chanters, Chancellors, Sub-treasurers, Succentors, and Sacrists, and all Vicars Choral and Choristers, Old Vicars, and New Vicars, of any Cathedral or Collegiate Church, and all other their Under Officers, out of the Church of England and Dominion of Wales, and out of the Church of Ireland: And further, His Majesty will consent to suspend the Exercise of all Episcopal Government for the Space of Three Years, and hath consented, and will consent, to confirm the Form of Church Government now presented to Him for the said Three Years, and that no other shall be used during that Time; in which Time, His Majesty continues His Desire that a Consultation may be had with the Assembly of Divines at Westm'r, Twenty of His own Nomination being added, to the End that His Majesty and His Two Houses may within those Three Years inform themselves of the Practice of the Primitive Church in Point of Episcopacy, and may accordingly agree in limiting the Bishops to the Counsel and Assistance of Presbyters, and in the Exercise of their Jurisdiction, and increasing their Number if it be thought fit. And His Majesty will consent that, in case no Settlement shall be agreed on within the said Three Years, then, after the said Time, the Power of Ordination shall not be exercised by Bishops, without the Counsel and Assistance of Presbyters; and that no other Episcopal Jurisdiction shall be exercised by Bishops, but such, and in such Manner, as shall be agreed on by His Majesty and his Two Houses of Parliament. And His Majesty doth profess, That, if in that Time He be convinced that the Function of Bishops is not agreeable to the Word of God, or that Christ commanded any other Government, He will most chearfully embrace that, and take away Episcopacy: But, until He be so convinced, He believes Himself bound in Conscience to uphold that Function, as is above expressed. "For the Ordinances for settling the Bishops Lands upon Trustees, and for the Sale of those Lands; although His Majesty, upon conscientious Scruples (wherein He hath the concurrent Opinions of the Divines, as well of the Reformed as other Churches), hath not consented thereunto; yet He hath offered Satisfaction to all such as have purchased any of those Lands, or disbursed Money upon that Security, by legal Estates for Lives or Years (not exceeding Ninety-nine Years), reserving only the Propriety and Inheritance of those Lands to the Church and Churchmen, and the old Rent, or other moderate Rents, for their Maintenance; and that, if those Leases shall not suffice, His Majesty would propound and consent to some other Way, for their further Satisfaction; and therefore, other Satisfaction for those Debts and Engagements (which were the Motive for the Sale of those Lands) being proposed, and His Majesty having herein condescended as far as possibly He can, He desires His Two Houses would comply with His Majesty in this Particular. "His Majesty hath offered, by Act of Parliament, to confirm the Calling and Sitting of the Assembly of Divines, as largely in the Matter desired, as the Ordinance itself proposed for that Purpose. He hath likewise offered to confirm the Public Use of the Directory in all Churches and Chapels, as is desired in your Proposition, and to consent to the Repeal of so much of all Statutes as concern the Book of Common Prayer, and to take the same away out of all Churches and Chapels, except His Majesty's Chapel, where He intends the Use thereof may be continued, for Himself and His Household, until another Public Form of Prayer should be agreed on by His Majesty and His Two Houses. "His Majesty hath likewise consented to the Bill for suppressing of Innovations, wherein there is full Provision for the due Observation of the Lord's day; and offered (if that were not sufficient) to consent to the Matter of the Ordinance for Observation thereof as fully as is desired: But for the Ordinances presented to His Majesty which concern the Assembly of Divines, the Directory, the taking away the Books of Common Prayer, and the Observation of the Lord'sday, many Expressions therein require necessary Alterations, in respect of some Things happened since their first Framing; other reflect on former established Laws, and other Matters not necessary; and therefore, though He consented to the Matter therein desired, yet He could not confirm those individual Ordinances in Terminis, as there penned. "Whereas you conceive that His Majesty did not give His Assent to the Bill for the better Advancement of the Preaching of God's Holy Word in all Parts of this Kingdom; His Majesty, by His former Answer, did sufficiently express His Consent thereunto, by consenting to the Bill for suppressing of Innovations (in which that for the better Advancement of Preaching is included); and His Majesty doth again give His Consent thereunto, as also to the Bill against enjoying Pluralities of Benefices by Spiritual Persons, and Non-residency, formerly delivered to His Majesty, as is desired in your Propositions. "Touching Reformation of Religion; whereas you say, "That His Majesty's Answer comes far short of the Proposition, which (fn. 4) desires that His Majesty should consent that Reformation of Religion, according to the Covenant, be settled in such Manner as both Houses have agreed, or shall agree upon, after Consultation had with the Assembly of Divines;" His Majesty faith, That He hath answered all the Particulars which are set down as Branches of that general Proposition; and cannot think it will be expected that He should oblige himself generally to what His Two Houses shall hereafter agree touching Matter of Religion, before He be satisfied of the Nature thereof. "His Majesty conceives, that He had given a full Answer to the Proposition for an Act or Acts to be passed, for a stricter Course to be taken to prevent the saying or hearing of Mass in the Court, or any other Part of this Kingdom, or the Kingdom of Ireland; He having consented thereunto, with Exemption only of the Queen and Her Family (few whereof are of Her Profession), according to the Articles of Marriage agreed upon betwixt the Two Crowns, which His Majesty conceives His Two Houses will not advise Him to break: And as for restraining the Access of all others but Her Family, and in all Things else, His Majesty consents to that Proposition, as is desired. "Touching the Covenant; His Majesty answers, as formerly, That He remains yet unsatisfied to take it, or impose it on others; and conceives it not proper to be insisted upon at this Time; and that the End thereof (without taking it) will be obtained by this Agreement, if happily concluded. "For the Articles of Religion presented to His Majesty, which are desired to be confirmed by Act of Parliament; His Majesty hath already answered, "That He hath not yet had Time to peruse them with that Deliberation as is requisite, before He bind up Himself and His Subjects in Matters of Faith and Doctrine;" and conceives His Houses will think it not improper to respite the Consideration of them to a further Time, considering how perilous Definitions are in Matters of Religion, how long Time the Articles have been in framing, and that, since the Beginning of this Treaty, and not before, they came entirely to His Majesty's View. "His Majesty, having so far consented to the several Particulars of this Proposition that the remaining Differences are very few, doth therefore earnestly desire His Two Houses, that they may be no Obstacle to the Settlement of the blessed Peace now in Hand. "Newport, the 21 Octobr. 1648. "Your Majesty having delivered in a Paper of this present 21th of October, as Your final Answer to us, as to the Proposition concerning the Church; we shall transmit the same to both Houses of Parliament; and go on in the Treaty, according to our Instructions. "That the Chancellor, or Lord Keeper, Lord Treasurer, Commissioners of the Great Seal or Treasury, Lord Warden of the Cinque Ports, Chancellor of Exchequer and Dutchy, Secretaries of State, Master of the Rolls, Judges of both Benches, and Barons of the Exchequer, of the Kingdom of England, be nominated by both Houses of the Parliament of England, to continue quamdiu se bene gesserint; and, (fn. 5) in the Intervals of Parliament, by such Committees of both Houses of Parliament as both Houses of the Parliament of England shall nominate and appoint for that Purpose, to be approved or disallowed by both Houses at their next Sitting. "His Majesty doth consent thereunto, as is desired, so as the Time for Nomination be limited to Ten Years. "Having received Your Majesty's final Answer to us as to our Proposition of this 21th of October Instant, concerning Nomination of Officers; we shall transmit the same to both Houses of Parliament; and go on in the Treaty, according to our Instructions. "That an Act be passed, for the granting and confirming of the Charters, Customs, Liberties, and Franchises, of the City of London; notwithstanding any Nonuser, Misuser, or Abuser. 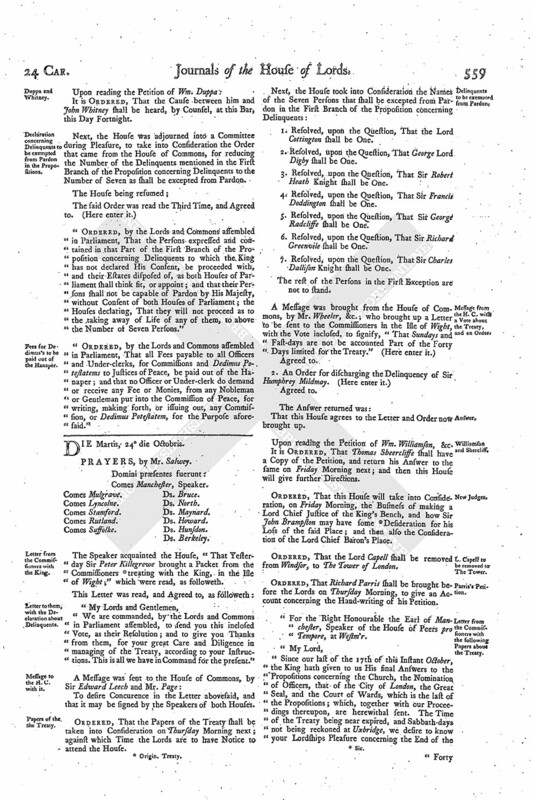 "And, for Prevention of Inconveniencies which may happen by the long Intermission of Common Councils, it is desired, that there may be an Act, That all Bye-laws and Ordinances already made, or hereafter to be made, by the Lord Mayor, Aldermen, and Commons, in Common Council assembled, touching the Calling, Continuing, Directing, and Regulating the same Common Councils, shall be as effectual in Law, to all Intents and Purposes, as if the same were particularly enacted by the Authority of Parliament; and that the Lord Mayor, Aldermen, and Commons, in Common Council, may add to or repeal the said Ordinances, from Time to Time, as they shall see Cause. "That such other Propositions as shall be made for the City, for their further Safety, Welfare, and Government, and shall be approved of by both Houses of Parliament, may be granted, and confirmed by Act of Parliament. "His Majesty doth consent thereunto, as is desired. "Newport, the 21 of October, 1648. "Having received Your Majesty's final Answer to us, as to our Proposition of this 21th of October Instant, concerning the City of London; we shall transmit the same to both Houses of Parliament; and go on in the Treaty, according to our Instructions. "Newport, the 21th of October, 1648. "That all Grants, Commissions, Presentations, Writs, Process, Proceedings, and other Things, passed under the Great Seal of England (in the Custody of the Lords and other Commissioners appointed by both Houses of Parliament for the Custody thereof) be, and by Act of Parliament with the Royal Assent shall be declared and enacted to be, of like full Force and Effect, to all Intents and Purposes, as the same or like Grants, Commissions, Presentations, Writs, Process, Proceedings, and other Things, under any Great Seal of England, in any Time heretofore, were or have been; and that, for Time to come, the said Great Seal now remaining in Custody of the said Commissioners continue and be used for the Great Seal of England: And that all Grants, Commissions, Presentations, Writs, Process, Proceedings, and other Things whatsoever, passed under or by any Authority of any other Great Seal, since the 22th Day of May, Anno Domini 1642, or hereafter to be passed, be invalid and of no Effect, to all Intents and Purposes, except such Writs, Process, and Commissions, as, being passed under any other Great Seal than the said Great Seal in the Custody of the Commissioners aforesaid, on or after the said 22th Day of May, and before the 28th Day of November, Anno Dom. 1643, were afterwards proceeded upon, returned into, or put in Ure in, any of the King's Courts at Westm'r; and except the Grant to Mr. Justice Bacon, to be One of the Justices of the King's Bench; and except all Acts and Proceedings by virtue of any such Commissions of Gaol Delivery, Assize, and Nisi Prius, and Oyer and Terminer, passed under any other Great Seal than the Seal aforesaid in Custody of the said Commissioners, before the First of October, 1642. "His Majesty doth consent, as is desired. "Having received His Majesty's final Answer to us, as to our Proposition of this 21th of October Instant, concerning the Great Seal; we shall transmit the same to both Houses of Parliament; and go on in the Treaty, according to our Instructions. "We humbly desire Your Majesty to give Your Royal Assent to the Proposition ensuing. "That an Act or Acts of Parliament be passed, for the taking away of the Court of Wards and Liveries, and of all Wardships, Liveries, Primer Seisins, and Ouster le Maines, and of all other Charges, incident unto, or arising for or by reason of, any Wardships, Liveries, Primer Seisins, or Ouster le Maines, and of all Tenures by Homage, Fines, Licenses, Seizures, and Pardons for Alienation, and of all other Charges incident or belonging thereunto, or for or by reason thereof, from the Twenty-fourth Day of February, which was in the Year of our Lord God 1645; and that all Tenures by Knights Service, Grand Sergeantry, Petty Sergeantry, or Soccage in Capite, either of His Majesty, or of any other Person or Persons, may be, from the Time aforesaid, turned into Free and Common Soccage; and that the Sum of Fifty Thousand Pounds per Annum be granted to the King, by Way of Recompence. "His Majesty doth consent thereunto, as is desired; so as He may have in Recompence for the same One Hundred Thousand Pounds per Annum assured unto Him, His Heirs and Successors. "Having received Your Majesty's final Answer to us, as to our Proposition of this 21th of October Instant, concerning the Court of Wards and Liveries, &c.; we shall transmit the same to both Houses of Parliament; and go on in the Treaty, according to our Instructions. "Whereas Sir Humphry Mildmay was admitted to his Composition for his Delinquency, at the Fine of One Thousand Eight Hundred and Forty-six Pounds, whereof he paid the Sum of Five Hundred Pounds to supply The Holy Island, and hath since at several Times paid the Sum of Seven Hundred Seventy-five Pounds more, other Part of the said Fine: It is Ordered, That the Residue of the said Fine be, and is hereby, remitted and discharged; and the said Sir Humphry Mildmay, his Executors and Administrators, are hereby absolutely freed and discharged from Payment thereof, and every Part and Parcel thereof: And the Committee at Goldsmiths Hall are to take Notice hereof, and to bring in an Ordinance, in usual Form, for Discharge of his Sequestration, and Pardon of his Delinquency." Ordered, That Dr. Aylett give Institution and Induction unto Wm. Stanley Master of Arts, to the Rectory of Ripple, in the County of Kent; Salvo Jure, &c.: Mrs. Anne Crayford Widow, Patroness. Ordered, That Doctor Aylett give Institution and Induction unto Thomas Attwood Rotherham Clerk, Master of Arts, to the Rectory of Boreham, in the County of Essex, void by Death; Salvo Jure, &c.: Granted by the Great Seal. Ordered, That Doctor Aylett give Institution and Induction unto Thomas Hilliard Clerk, to the Rectory of North Fambridge, in Com. Essex, void by Death; Salvo Jure, &c.: Granted by Great Seal.